A Belgian teenager said on Tuesday she would sue a tattoo parlour which she said covered half her face with stars while she was asleep, reports said. Kimberley Vlaeminck, 18, was left sporting 56 black stars of various sizes on the left side of her face, from nose to ear and brow to chin. The young housewife said she had gone to the tattoo parlour in the western town of Courtrai and asked for three small stars on her face. "I wanted him to tattoo on just three little points but he suggested three stars saying it would look prettier," Vlaeminck told local press. "When he started the tattooing I didn't want to feel the pain and so I went to sleep. I had got up at five in the morning," she said. "I woke up when he was starting to tattoo my nose and I saw what he had already done. I counted 56 stars, it's frightening," she told the Flemish daily Het Laatste Nieuws. 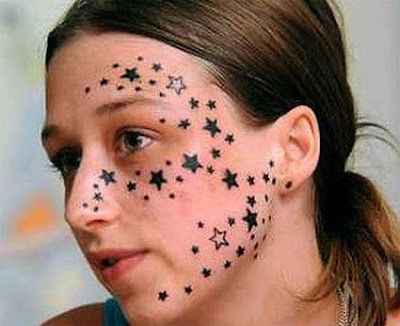 Kimberley Vlaeminck, 18, claims she was sleeping when Rouslan Toumaniantz tattooed 56 stars on her face. The young woman, who said she doesn't dare walk down the street, has decided to sue the tattoo parlour. She said she also hoped to have her starry appearance reversed by laser treatment, which would cost thousands of euros. Tattoo artist Rouslan Toumaniantz denied that his client had fallen asleep. "She was awake the whole time, I don't use hypnosis or drugs. She agreed to it. The problems started when her father and his friend saw the tattoos," he told the paper.